Delicious Italian dumplings made with ricotta instead of potato. Get the recipe for The Easiest Gorgonzola Cream Sauce here. 1. Rinse a sheet of cheesecloth under cold running water, squeeze it dry, and line a large strainer with it. Place the strainer over a bowl; add the ricotta, cover, and refrigerate overnight. The next day, discard the drained liquid, wipe the bowl dry, and tip in the thickened ricotta. Press down on the centre of the mound to form a well. Add the egg and egg yolk, and gently mix into the ricotta with your hands, lifting the mixture, then add the salt, pepper, and lemon zest; gently mix together as before. The dough should be just tacky to the touch-if it feels wet and sticky, incorporate a little more flour. 2. Flour a work surface and then, working in batches of about a handful at a time, roll the dough into a log about 3/4 inches (2.5cm) wide. Flour a knife and trim the end of the log at an angle. Maintaining that angle cut the roll into equal pieces about 1 inch (2.5cm) long. 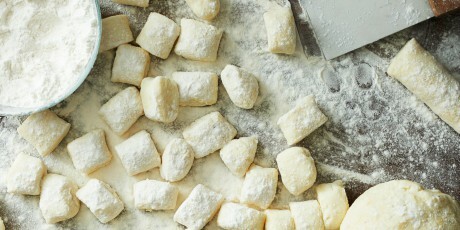 Transfer the gnocchi to a lightly floured baking sheet. 3. Bring a large pot of salted water to a vigorous boil. Add the gnocchi, and stir very gently to prevent them from sticking. As they float to the surface-after about 2 minutes-remove them with a slotted spoon to a lightly oiled baking sheet to cool. 4. Heat your preferred sauce in a deep saucepan and gently fold in your freshly cooked gnocchi while sauce is hot. Spoon into serving bowls.